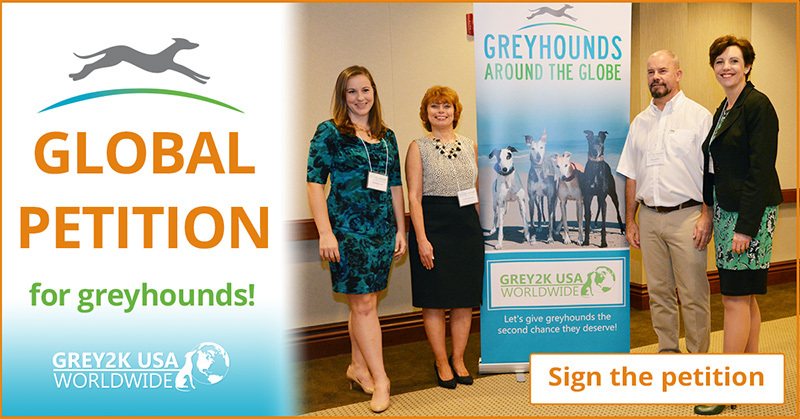 The first Greyhounds Around the Globe conference took place in Delray Beach, Florida the weekend of October 15, 2016. The event began with the release by ABC News of our video exposing the cruelty of dog racing at nearby Palm Beach Kennel Club. We exposed the violent collisions, injuries and deaths that greyhounds suffer at this facility. In fact, according to state records, a dog dies every three days at a Florida racetrack! Senator Maria Sachs opened our conference with a rousing address, calling for advocates to keep working until dog racing comes to an end in the state where it was first legalized. 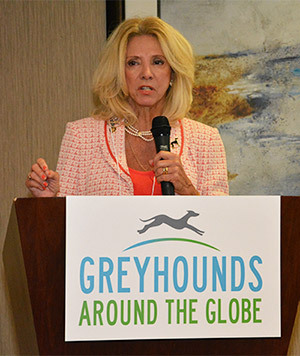 GREY2K USA Worldwide President Christine Dorchak spoke next, sharing a letter from the conferees to the heads of all countries with dog racing. Chloë Waterman of the ASPCA shared important information on how best to lobby for the animals. Representatives Matt Gaetz and Jared Moskowitz then outlined their ideas for closing down dog racing once and for all in Florida. Over the course of the day, we heard from allies at Animals Asia and ANIMA Macau about their work in China and new preparations to adopt the Canidrome greyhounds. RSPCA International’s Paul Littlefair spoke about his work promoting compassion in the region. 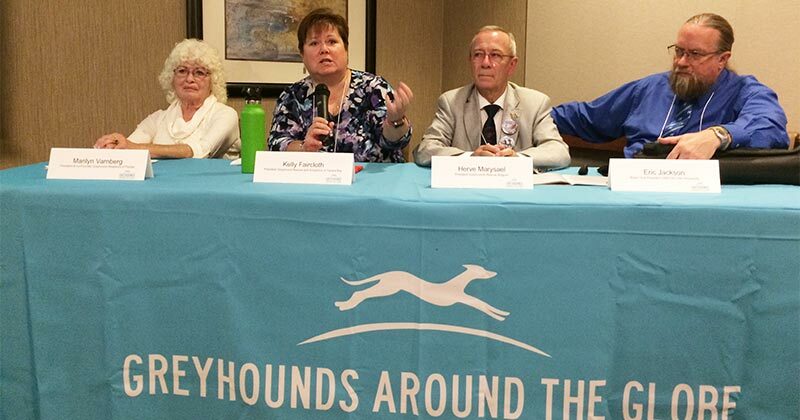 Advocates from Greyhounds Rescue Belgium and Pet Levrieri Italy spoke about their determined efforts to rescue dogs from racetracks in Ireland and Scooby’s president described his work saving greyhounds (galgos) from hunters in Spain. Greyhound Compassion’s founder Lucinda Read discussed the pending closure of London’s last dog track and the campaign to pass a new greyhound protection law in her country. The President of RSPCA Australia provided information on her strategy to keep fighting for greyhounds Down Under. Meanwhile, the leaders of Greyhound Adoptions of Florida and GREAT revealed their heart wrenching experiences over the years, while GREY2K USA’s own Vice President Eric Jackson spoke about how his group Greyhound Companions of New Mexico find homes for greyhounds and their cousins, ALL of whom need our help. Finally, we all adjourned for a delicious dinner and to hear from keynote speaker, Wayne Pacelle, CEO of the Humane Society of the United States. His message to us all is that change starts with you! The evening then concluded with a celebration of GREY2K USA Worldwide’s 15th Birthday. Read about all of our speakers here and then please add your name to our global petition to end dog racing worldwide.